happened at the cross of Calvary. That day was a day greater than any other day. It held our freedom from sin and death. This page will transport you back in time. Come with me back to biblical days. Mingle with those who lived in Jerusalem during the first Easter. Come with me as we go back in time 2,000 years to ponder the events right before and right after the resurrection. During this exploration of the first Easter week, you will find yourself as a character in a realistic look at the cross and at the greatest story ever told. left all of Jerusalem questioning what would happen next. The New King James Version says, “And Jesus cried out again with a loud voice, and yielded up His spirit. Then, behold, the veil of the temple was torn in two from top to bottom; and the earth quaked, and the rocks were split, and the graves were opened; and many bodies of the saints who had fallen asleep were raised; and coming out of the graves after His resurrection, they went into the holy city and appeared to many. The events of the week before the resurrection and several weeks after the resurrection are nothing short of astonishing. A week before the resurrection of Jesus, Jerusalem was a hub of excitement. The talk of the town was the man named Jesus who rode on a donkey through the streets of Jerusalem. There he was seen receiving adoration from the crowds like he was a king. If you were living in Jerusalem at that time, you would have either participated in the adoration of Jesus as he made his way through town, or you would have watched, or you would heard the excited chatter from those who were there. Continue to picture yourself living in Jerusalem 2,000 years ago. Place yourself several days after the crucifixion of this man named Jesus. You walk out the door of your house and look up at the blue Jerusalem sky. You begin thinking back to the day that Jesus was killed. That day was a strange day. It was about noon when the sky got very dark. It was eerie, and it gave you an uneasy feeling. Then you remember back to the exact location where you were when the earth started violently shaking. You remember the panic that gripped all the people who were standing near you at the time. You hadn't gotten over the trauma of that day, when just a couple of days later another large earthquake happened. Your mind relives the emotions of those quakes. Fear again begins to rise up in you just as it did both times your body experienced the earth's convulsions. For the last several days, you have been hearing talk about the body of Jesus being missing. Someone you hardly even know told you some ridiculous story about seeing Jesus walking around Jerusalem. As you sit down on a large rock and stare out into the Jerusalem countryside, you remember back two days ago when you were walking past two priests who were whispering. You thought you heard them say that the thick holy veil in the Temple (that keeps the Holy of Holies private) was torn from top to bottom. Surely you must have misunderstood those whispered words. The whole city of Jerusalem has been a buzz about the events of the last few days. When the talk first started, you tried to dismiss all the weather events and crazy talk - hoping that life would just quickly get back to normal. But the rumors have continued. For you personally, none of the wild rumors compare with the bizarre stories about dead relatives and friends walking around. As you try to make some sense of the last few days, the most puzzling part is hearing your mother talking about seeing her dead sister. Could it be true that your aunt really is walking around visiting with your mother? And what about the story about your sister's best friend from childhood who died five years ago. Could it really be that she is now alive and walking around? And what about your neighbor who persistently tried to convince you that his grandmother sat and talked with him yesterday morning? Somehow, Jesus seems to be at the center of all of this. But how could that be? A few months ago, you went to see Jesus speak a couple of times. He seemed impressive. You saw miracles that you couldn't explain. But, you got busy and never really thought much about it. Now with all this talk, you are thinking - a lot. You wonder - just who WAS this Jesus who seems to be shaking your whole world? Who was that carpenter from Nazareth? How could he be called the King of the Jews. If you did live 2,000 years ago and if you were that unsaved character from Jerusalem, do you think you would you have investigated? Would you have investigated and then been compelled to receive Jesus as your Lord and Savior? Or would you have dismissed all the things that happened and tried to concentrate on getting back to life as usual? Let's spring forward 2,000 years. Come back to this present time period. Whether you are saved or not, I am challenging you to make a decision. Will you let this day pass you by without it permanently touching your heart? Will you allow the story of - Jesus at the Cross and the Resurrection of Jesus - compel you to new heights of love and dedication to the Lord and Savior of the World? Jesus on the cross - was for you and for me. Song - "At the Cross"
At the Cross, at the Cross where I first saw the light and the burden of my heart rolled away, It was there by faith I received my sight, And now I am happy all the day! 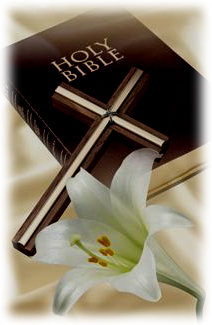 Find out a list of all our Easter pages by going to our Holiday Page. At the Cross - What are your thoughts about the events surrounding the resurrection?